James Andrew Miller, author of ESPN history Those Guys Have All The Fun, is a repository for ESPN contract information. From time to time he comes down from the mountain to share data that satisfies our most vulgar desire: to know how much money people on TV make. Last night he revealed that Jon Gruden is ESPN’s top-earning talent. Miller popped in not with just the answer to the question, but with a dollar figure. That’s a ton of money! 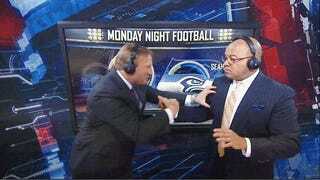 Gruden’s fine. He knows his football, he’s good on TV, he’s got good relationships with players and coaches, and he’s a big part of ESPN’s highest rated broadcast and its most valuable property. But he’s not irreplaceable, and paying anyone $6.5 million at a time ESPN is reportedly trying to cut $100 million from next year’s budget feels excessive. But ESPN may not feel like it’s competing with other networks for Gruden’s services. If the constant rumors about him returning to coaching are true, ESPN’s competing with the NFL.